If you love Mexican and Tex-Mex food, then this post is just for you! The awesome combination of flavors and fresh ingredients in these recipes makes for some delicious meals! Without a doubt, I am certain that you will find something that you like in the links below. And even better, you can surprise your family members or friends with some new authentic recipes. My love for Mexican food started when I was a little girl, obviously because I am Mexican. When I came to the United States for the first time, my husband told me, “we are going to go eat some Mexican food!” — He took me to Taco Bell — so right away I found out the difference between real Mexican food and not so Mexican food. However, as the time went on I tried other “Tex-Mex” style foods that were better than Taco Bell, and I started to love many of them – and now I can say with confidence that I love Tex-Mex food as well! So this round-up is dedicated both to authentic Mexican foods like the ones I grew up eating, and some delicious Tex-Mex recipes that I love now. Check them all out below and if you like them, definitely try them! I do so love TexMex food. I’m pinning this right now!! What a delicious treasury of recipes! 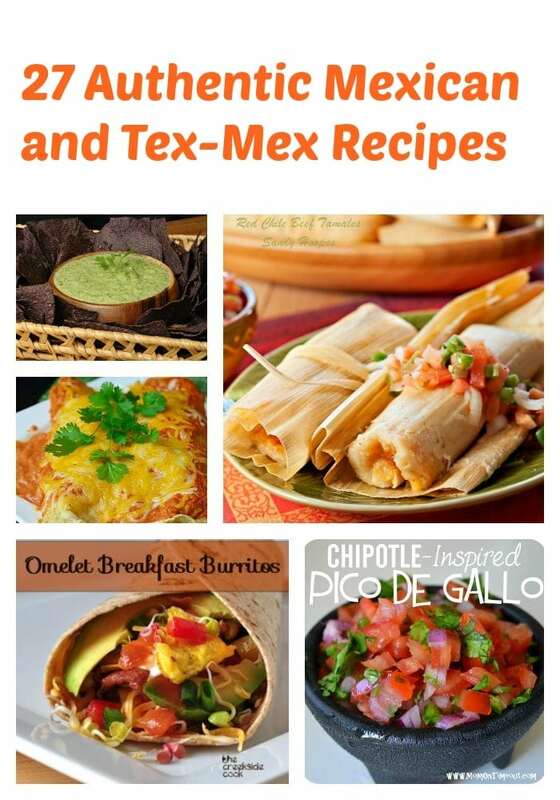 I’m always looking for “just one more” SW or TexMex dish and can’t wait to browse your archives. What a great collection! Thank you for including my carnitas! Pinning! !